SPRING BICYCLE MAINTENANCE. - Terry Peloton. You are here: Home / Sidesaddle Blog / SPRING BICYCLE MAINTENANCE. 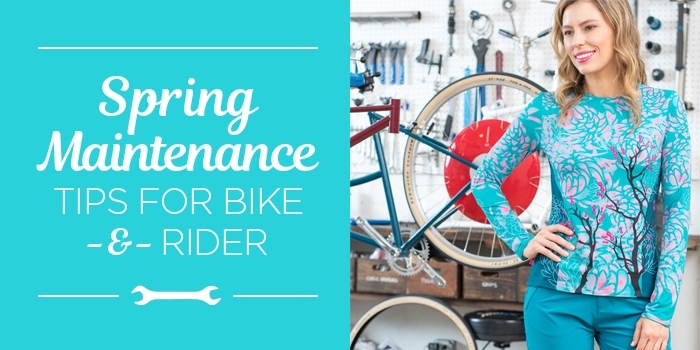 Add the Cyclist to Your Spring Bicycle Maintenance Checklist. The weather’s warming up and finally the trails and byways are beckoning again in our part of the world. Time to give our trusty machines some love to get them ready for a trouble-free season ahead. And while we’re on the topic, why not do the same for ourselves? Here are 6 do-it-yourself spring bicycle maintenance tips, plus a few thoughts for preparing the rider, too. 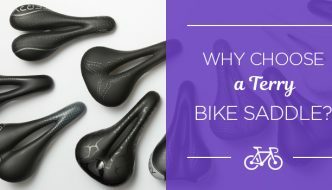 Is your bike still sitting where you left it last fall, maybe put away with the expectation that there would be more fall rides to follow, that you would get around to a thorough cleaning over the winter when fair-weather cycling was done? Let’s just say if your bike still bears a crust of last fall’s mud and crud, you’re not alone. For most of us that means spring bicycle maintenance starts with a good cleaning, with particular attention to the bike’s drive train. Use soapy water, gently wipe all non-lubed surfaces with a damp rag, and dry/buff after the dirt is gone. Lift each end of the bike and spin each wheel. If the wheel is out of true you’ll notice it with a fixed point close to the rims as a gauge, like brake blocks, or chainstays if you have disc brakes. Running true? Cool. Otherwise, time for a trip to the bike shop, or pull out your spoke wrench if you’re so inclined. Take a look at the space between rims and brake blocks. If they are not equal on both sides the calipers need centering. Loosen the bolt holding the calipers to the frame (5mm hex bolt on most brakes), center the brake, tighten up. Now look at the gap between brake block surfaces and the rims. A smaller gap means swifter, surer braking, so use the microadjusters on the cable ends to close up the space if needed. Check the brake cables for smooth operation. If there’s a lot of friction in the cable the calipers will be harder to squeeze and won’t snap away from the rims as they should. Older bikes that see dirty roads and weather are most likely to be affected. A few drops of oil run carefully down the cable core into the casing can help. You’ll need to detach cables from shifters and brakes to do this. Remove them completely and get plenty of lube inside the cable casing to fix a bad case. Keep the oil well away from rims and brake blocks! For light dirt on the chain, brush off any loose stuff, use chain lube liberally and run the chain backwards through a rag until it’s good and clean again. For heavy dirt the chain should come off the bike for a good soak and scrub. If you’re not equipped your local friendly bike shop will surely help out here. Pop out the back wheel, brush and floss the cassette cogs with a rag to get rid of accumulated dirt and grease. 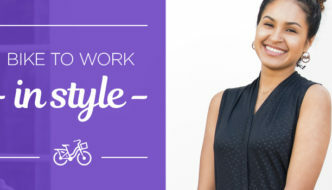 Check for chain/cog wear – change gear to lowest (chain on largest cog at the back). Push and pull the chain where it wraps around the cog. If it’s worn you will be able to move the links of the chain around. A small amount of play is okay, but if there’s a lot, and teeth on the cogs are getting a noticeably hooked profile, it’s time to replace. Set your chain on the big ring at the front, smallest cog at the back. Shift down one gear to the next cog at the back. Now look down from above and behind to check where the derailleur jockey cage is positioning the chain. Does it line up exactly with the cog the chain is on? Perfect – done. If it’s toward the wheel, turn the adjuster at the end of the cable ½ turn clockwise. Counter-clockwise if it’s away from the wheel. Change gears again and recheck, adjust until the chain is aligned nicely. Check derailleur cables for smooth operation as you did the brake cables. Clean and lube any cable sections that are routed through slides or pulleys. Make sure the fasteners all over the bike are secure, and pay particular attention to the stem and headset. Things have a habit of working loose over the miles, so retighten anything that needs it. 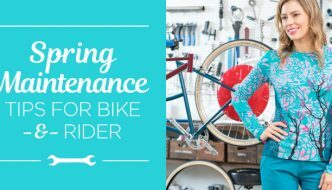 With a small selection of tools, and a little know how, you’ll be able to handle most of these spring bicycle maintenance tasks yourself. At the very least you’ll be able to identify problems that need some expert attention from your local bike mechanic. Here are a few more spring cleaning tips from our archives, and a helpful video: How to Clean and Lube Your Bicycle. Now, how about a little TLC for the human “machine” – so we can prepare for a trouble-free season too? Here is some golden spring advice from our own Georgena Terry. Thanks for these tips on cleaning the chain, derailleur and bike. I started riding the first day of Lent, the weather being semi-conducive. The seasonal standing water, drew grit and grime into and across all places. I can hear the friction, see the forming rust and coat of grime. The organized progression found in this article instills the need to get on top of the required task.